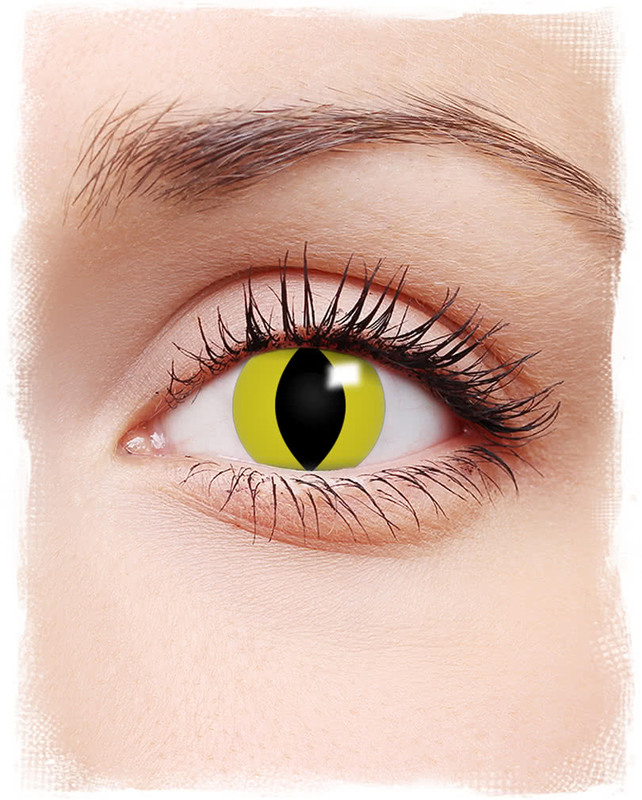 Cats are supple creatures that move very gracefully.For those who want to slip on Halloween itself sometimes in the skin of a cat being, we have the contact lenses yellow cat eyes motif in the range. 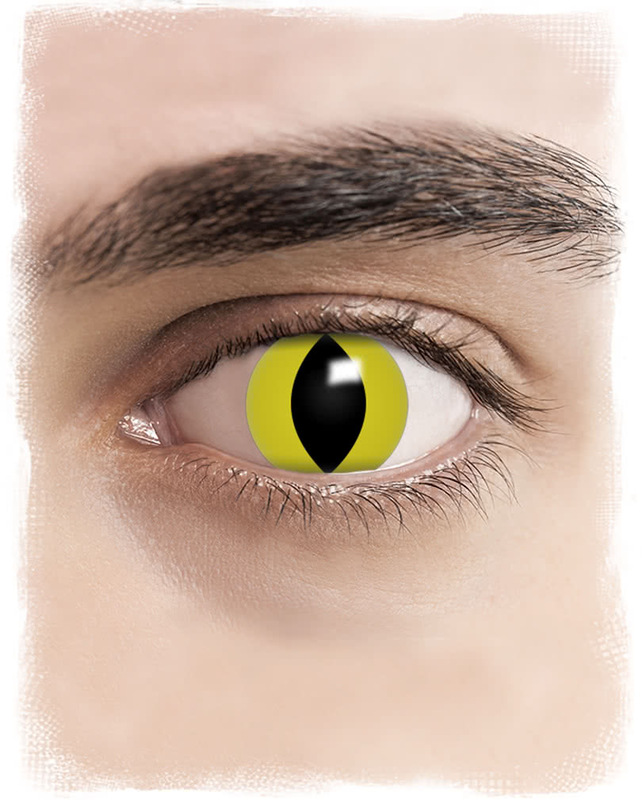 The contact lenses yellow cat eyes motif have an especially pleasant wear comfort and an eye on the next Halloween party.Up to 3 months with proper care applicable.We'll send you contact lenses that have a unopened shelf life of several years.These are suitable for dark and light eyes and have a very high opacity as well as an extremely quality.Made in the sandwich method.This move does not guarantee the ink particles in the eye.Not suitable on the road! Order now at best equal to the matching Contact Lense Solution 50 ml with. To ensure that you safely can carry with best view your lenses, you should read the following instructions carefully and follow them at all times. Please retain these instructions for future reference later with any inquiries can once again. If you use contact lenses for the first time, you should increase the wearing time of the lenses slowly.Wear the lenses on the first day for no more than 4 hours and extend the wearing time daily at 2 hours.Longer than 8 hours at a time, the lenses should never be worn. The lenses are furthermore not suitable for persons under 18 years of age. Avoid touching your lenses with clean, dry hands. When you first open the packaging indicates that the lens is intact and completely surrounded by liquid. Do not use the lens if it is dried out or damaged. The lenses are designed for a wearing period of three months and should then be disposed of accordingly. The lenses are to take mandatory before the first use of the original packaging and lay out for at least 4 hours in fresh contact lens solution. Only then the contact lens is used according to instructions. Please observe the exact further care instructions. 1Take a lens from the package. 2Place the lens on the right index finger and establish on the fingertip if the lens is right side up. 3Keep your upper eyelid with your left index and middle finger wide open while you hold it open with your right middle finger the lower lid. 4Place the lens on your eye. 5Repeat steps 1-4.with the other lens. Look upwards and hold your lower eyelid down.Press the lens with your thumb and a finger together slightly and then lift it out. Always follow the instructions on the bottle of your contact lens solution. must be handled accordingly with extreme caution. Then insert the lenses for at least 4 hours in fresh contact lens solution. Clean and disinfect your lenses again and check it carefully for any damage. If you have doubts about the integrity of the lenses is to visit your optometrist before wearing your lenses again. Note: We recommend to visit an optician or doctor giving you the proper use of contact lenses explained in detail and can practice with you. Always remember that the health of your eyes is vital to your good vision.Do not take any risk through carelessness or vanity, and therefore stick to the following for wearing. 1We recommend monthly to renew and maintain the lenses daily. 2For questions regarding the proper handling of contact lenses we recommend you to consult your optician. 3Never been used contact lens solution again. regarding storage times and mode of treatment. 5Remove the lenses and consult an optometrist if your eyes hurt, redden or burn when your eyes water or your vision is impaired by reflections of light or color swatches. 6Remove the lenses before you go to bed or lie down longer. 7Keep your fingernails short, because long nails can damage the lenses. Ophthalmologist or areconsult your doctor. 9Do not use saliva to wet your lenses or to clean. 10Do not wear your contact lenses if you use eye products or eye drops. 11Never wear lenses if they are damaged or scratched, or if they have deposits that can not be removed. 12Wear eye make-up after inserting the lenses on and remove it after removing the lenses.Use fiber-free as possible, water-soluble eye cosmetics and oil-free products. 13Do not use harsh household cleaners while you are wearing the lenses. 14Never use household products (suchB.Disinfectant) or tap water to clean your contact lenses or storage containers.You can seriously damage your eyes. 15Do not wear the lenses in smoky or humid environments. 16Keep it clean storage boxes of lenses. 17Do not go swimming unless you wear a waterproof swimming goggles with the lenses. 18Keep the lenses out of the reach of children. cosmetic sprays come up with your contact lenses in contact. 20Do not wear your contact lenses if toxic or irritating vapors are present. 21Share the lenses with anyone else. 22Wearing the effect lenses is prohibited while driving.